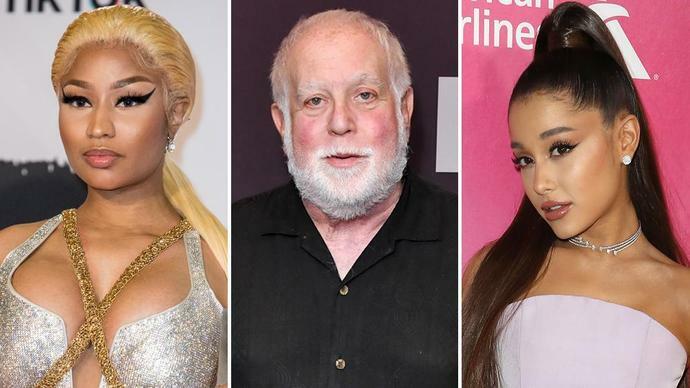 Nicki Minaj is speaking out against Grammys producer Ken Ehrlich just days after Ariana Grande called him out for statements regarding her not performing at this year's Grammy Awards. "I pissed off the same man Ariana just called out for lying. Grammy producer KEN," Minaj wrote on Twitter. "I was bullied into staying quiet for 7 years out of fear. But I'll tell my fans the REAL on the next episode of #QueenRadio they deserve the truth." The statement was in response to a fan who tweeted her confusion over why Minaj had never won a Grammy before: "Nicki Minaj has been at the top of her game for way too long to not have had a Grammy," she wrote. "I don't know what white man from the boards she pissed off." Prior to the Grammys, Grande also expressed her frustration with Ehrlich after he told the Associated Press that she would not be performing at the ceremony due to her inability to put together a performance in time for the show. Variety previously reported that Grande wasn't performing at or even attending the ceremony due to a disagreement with producers over which songs would be featured. "i've kept my mouth shut but now you're lying about me. i can pull together a performance over night and you know that, Ken," she tweeted. "it was when my creativity & self expression was stifled by you, that i decided not to attend. i hope the show is exactly what you want it to be and more." "i offered 3 different songs," she continued. "it's about collaboration. it's about feeling supported. it's about art and honesty. not politics. not doing favors or playing games. it's just a game y'all.. and i'm sorry but that's not what music is to me." Minaj's comments about Ehrlich also come on the heels of news that the rapper would no longer be attending the BET Experience Concert in June. Minaj was initially supposed to co-headline the concerts with Cardi B but has since pulled out after taking offense to one of BET's Grammy tweets. "Meanwhile, Nicki Minaj is being dragged by her lacefront," BET tweeted after Cardi B took home a Grammy for best rap album. In response, Minaj tweeted, "Young Money will no longer be apart of the BET Experience or award show. Summer Tour dates dropping soon." "BET loves Nicki Minaj. We have supported her from the very beginning of her career and will continue to do so moving forward. Nicki has paved the way for so many performers and has solidified her place as one of the most powerful figures in the music industry," the statement reads. "Unfortunately the respect we have for Nicki was violated by this post that should never have been written. The post does not reflect how we feel about Nicki. And further does not reflect our company values." "We deeply apologize for the hurt, disappointment and confusion that this post has caused," the statement continues. "We are committed to doing everything we can to address the situation. We are also conducting an internal audit to assure these types of posts are not published again. We have apologized to Nicki and her team. The post has been removed and we have taken additional appropriate action. We understand Nicki's position and look forward to continuing our dialogue with her. Finally, we apologize to all of her fans. This should have never happened.